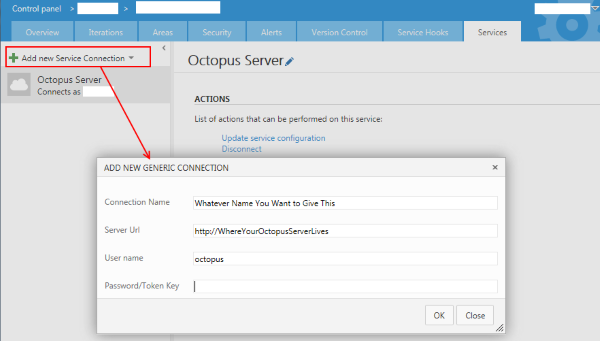 Last week I worked on getting Octopus Deploy's Build Task installed in TFS 2015. What I found was that there was a lot of great articles that all had parts of the process, but there was nothing that brought all the steps together. So here's my list, complete with links to the various posts/blogs with the details. OctoPack is... "The easiest way to package your applications from your continuous integration/automated build process is to use OctoPack. OctoPack adds a custom MSBuild target that hooks into the build process of your solution. When enabled, OctoPack will package your Windows Service and ASP.NET applications when MSBuild runs." (from http://docs.octopusdeploy.com/display/OD/Using+OctoPack). OctoPack creates a nice little NuGet package out of your project which gets consumed by Octopus Deploy (which uses its own Nuget server under the hood to facilitate deployments). You can install OctoPack by adding it as a Nuget package in Visual Studio and you should add it to all the projects you'll be deploying. As an example, you'd add it to your web project but not to your unit test project. Over in TFS, you need to add some arguments to the MSBuild Arguments field in your Visual Studio Build step. You need a generic service for the custom task to work. This service and your team project will share the same API key, which lets your build kick off the deployment via the service. To create one, go into your team project and click the little gear icon in the top right corner (next to your user name). This will take you to the admin page, where you should see a number of tabs like Overview, Iterations, etc. Services will be the last one, click it. Connection Name: Whatever you want to name this service connection. User name: Just put Octopus. Why? Dunno, that's what this post told me to do. Password/Token Key: Past in the API key that you created a few steps ago. Installing the Octo Build Task for Visual Studio Online is super easy, but for on-premise it requires some extra steps. 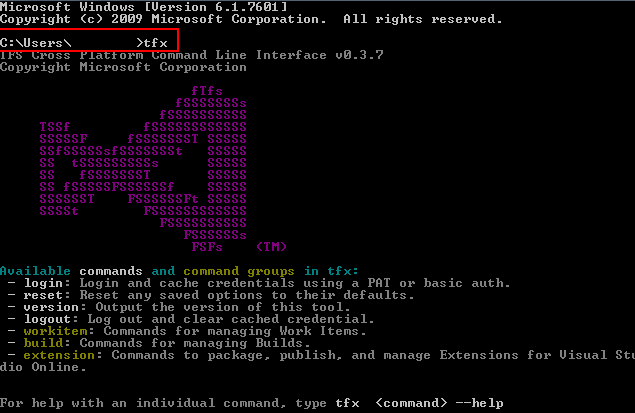 To install the task (or any task for that matter, see the links at the end of this post for more info on that) you need a tool called TFX-CLI (TFS Cross Platform Command Line Interface). This is a tool that lets you do various things with TFS from a console, but it requires Node.JS and NPM. So before you install TFX-CLI, you need Node and NPM on your system. Note that this doesn't need to be installed on your TFS server. As long as you have the proper permissions, you can install this locally on your machine and just connect to your TFS box. You need to have an internet connection for this to work, as its going out and getting the latest copy. You can connect using TFX-CLI in two ways – with a personal access token (VSO) or with Basic Authentication. Microsoft NTLM isn't supported for TFX-CLI yet, so while you'll be passing in your domain credentials you'll be doing it over "basic" auth. Note that if you want to secure it (i.e. SSL) then you have to do that yourself manually, you don't get it out of the box. One thing I will call out – make sure you set the basic auth at the web application level and not the web site level, otherwise you'll just get invalid login responses in TFX-CLI. Pull down the OctoTFS project from Github. You'll need Git installed for this to work (https://git-scm.com/). Here I'm putting the OctoTFS project in a folder called "OctoTFS" in my C: drive. FINALLY we can get the Octopus Build Task installed in TFS! Now you need to log in to your TFS server. Type tfx login –auth-type basic. You'll be asked to enter in the Service URL, which is the URL to the TFS collection you want to connect to. For your username and password, enter in your domain credentials or if you have a local account on the TFS server log in with that. and hit enter. You should see green text saying that the build task was uploaded successfully! Head over to your TFS instance and bring up one of the projects within the collection you specified. Edit one of the builds (or create a new one) and add a deployment step. 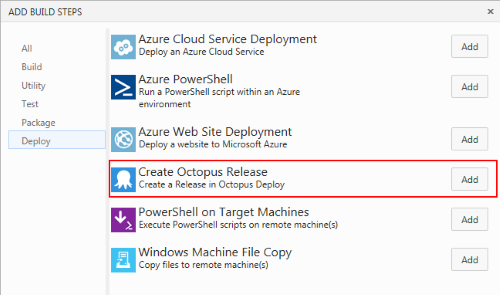 You should now see the Octopus Deploy Build Step as an option! TFS will have to suffer through awkward deployment scenarios like this compared to the ease of installation that Visual Studio Online provides (adding this build task to VSO is automated and requires only a few button clicks to install). While it's great that we have tools like TFX-CLI, better (and updated) documentation would go a long way to help those of us trying to get as much out of our on-prem TFS. You may be wondering why this isn't documented anywhere already. There actually is a lot of documentation out there about this process, but none that covered everything start to finish. Hopefully anyone else looking to get this working in their on-prem TFS environment can avoid some of the pain I went through (or even better, the install process for custom build tasks improves and this whole post becomes irrelevant).